My first real date with Chris was to a school dance. We went on a double date with mutual friends, and we left the pre-dance dining choice up to them. They chose a local Chinese restaurant that I enjoyed and had been to many times with my family. Unbeknownst to me, at this time, Chris hated Chinese food. He was, (and still sometimes is), a notoriously picky eater, and didn't know of a single dish he enjoyed there. He wanted to impress me though, and didn't protest the restaurant choice (especially after I made known that I enjoyed going there). If I remember correctly, he discovered he liked beef fried rice that night. I ordered the chicken fried rice, which was my favorite dish there, and is my go to dish to order at any new Chinese restaurant we're trying out. 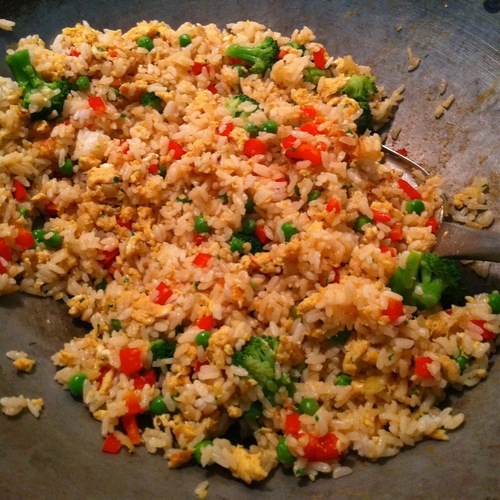 Since that night, Chris has found many Chinese dishes he enjoys, as have I, but we keep coming back to our mutual favorite — fried rice. I usually halve this recipe (it's huge!) and it barely fits in my wok. I also tend to throw in whatever vegetables I have on hand. In fact, I don't think I've actually followed this recipe to the letter yet! It's very flexible, and forgiving if you accidentally put too much soy sauce or too little ginger, or any other adjustment you may find yourself making. Fresh ginger is a wonderful thing in this, and completely worth buying if you don't keep it on hand, but ground ginger can be substituted in a pinch. Make sure to precook any larger/thicker veggies you want to use, otherwise they will end up undercooked. optional other vegetables: peas, broccoli (precook), corn, water chestnuts, bamboo shoots, etc. Place eggs in a bowl with spring onions, soy sauce, and ginger, and beat lightly with a fork. Heat oil in a hot wok until the surface of the oil seems to shimmer slightly. Add onion and stir-fry for 30 seconds. Pour in egg mixture and leave to cook for 10 seconds before folding egg mixture onto itself with a spatula and lightly scrambling for about 1 1/2 minutes or until mostly cooked through. Add rice and extra soy sauce and stir-fry for about 1 1/2 minutes, using the spatula to break the egg up into smaller pieces. Lastly toss in cabbage and any other veggies you choose and stir-fry about 20 seconds, or until vegetables are combined and heated through. Enjoy!